Nanga Kaye (right) is the agriculture director for Integrated Community Development International (ICDI), a faith-based nonprofit organization working in the Central African Republic and other countries. 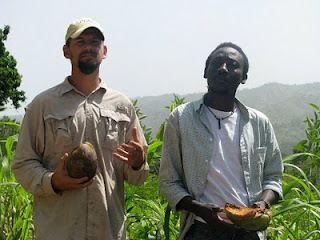 He traveled to Haiti with Hope for Haiti Foundation in September 2010, where he helped evaluate agricultural practices in rural Haiti and find ways to improve farming efficiency. Originally from Chad, Africa, Nanga technically lives in Cary, North Carolina – when he’s not living life at 30,000 feet, jetting back and forth across the globe for his work with ICDI. Five months have passed since I last set foot on the Haitian soil. Yet my mind drifts back on occasion to what remained of the mangled city of Port-au-Prince after the earthquake. I can still see clear as the day the menacing cracks on standing buildings and pavements. I cannot help but think of the tent-cities and their cortège of portable toilets, the bladders discharging water to the queues of the thirsty and yes, the faces of so many milling about in the fields of grief and desperation. Now and then ,in the safety of my refuge, the distant sights of the narrow valleys, the misty mountains and the steep trails that welcomed me those many weeks ago return to inspire me. I had traveled to Haiti in the company of a dozen of volunteers working for Hope for Haiti Foundation in the hopes that we might observe, learn, and assist in whatever way we could. On the morning of September 19 2010, first-timers and returnees alike, we bonded and soared through the air bound for Haiti. It wasn’t long after takeoff from Miami that the expanse of the blue-green ocean waters faded into chains of mountains then rows of trees and buildings. Once off the plane and out into the open, we were greeted by a warm and thick tropical air made heavier by the chaos and noise of baggage carriers. We were quickly ushered into vans, fed, and led out of Port-au-Prince after a good bath of smoke and dust generated by traffic jams. After snaking our way up and down rugged terrains and crossing countless rivers, darkness finally swallowed us into Zorange, a region perched on the heights somewhere on the southeastern corner of Haiti. At dawn we awoke to crowing roosters and barking dogs. Slowly as the sun rose, the mist lifted revealing the handy work of time on creation. No need to waste time when one has a date with an innocent land of ageless beauty. For several days, I walked the land, shook hands with people, and lingered under shades of small family farms savoring delicious coffee and fresh coconut milk. While I had filled my heart with majestic sights to last me ages, I found myself ill-equipped to offer much in a way of great insights to help the farmers of Zorange. It was rather they who had much to teach me about the unsung art and science of taming lands showered with rocks, wrestling the run-off of precious top-soils called by the valleys below and still holding on to the faith in the harvests to come. They said little. Indeed they didn’t need to. My reading of rows of pigeon-peas standing tall against the slopes, strong palm trees that gave hands to the vines of yams, breadfruits that adopted and were nursing taro roots under their wings was proof enough of their toil and sacrifice. In the end, Haiti humbled me. What I saw was a country beating the odds, a people determined to embrace hope and climb their way to a life of dignity. I will always treasure the gift brought to me by the courage of silent mules guided by brave women and of the grace of hands that work the sides of hills and mountains to feed the bright-eyed children who play and dream.